The Tennessee Bureau of Investigation is probing a Chattanooga officer's violent traffic stop for possible assault, misconduct and oppression, and the motorist at the center of it no longer faces criminal charges. Hamilton County District Attorney General Neal Pinkston's spokeswoman said he asked the TBI on Friday to look into officer Benjamin Piazza's March 2018 traffic stop after body camera and dashcam footage emerged of him punching and cursing motorist Fredrico Wolfe. 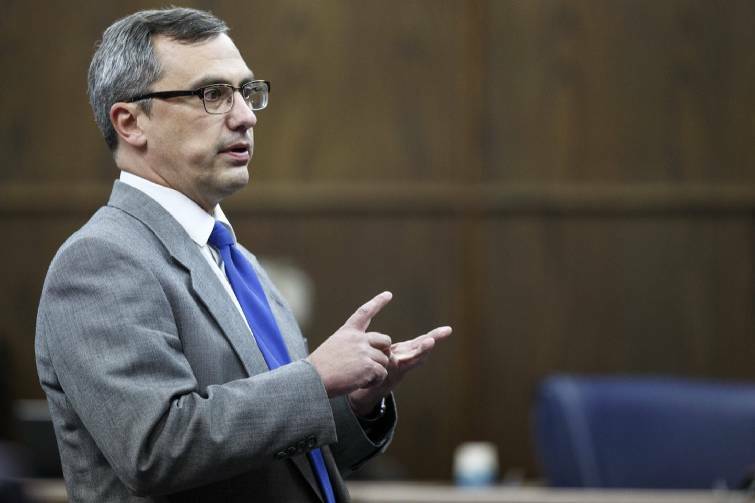 Pinkston also dismissed all of Wolfe's nearly 10-month-old charges from the encounter before they went to a grand jury, with his spokeswoman saying the "available evidence" made the prosecutor believe he wouldn't be able to secure a conviction. Pinkston was not the only one Wednesday to speak about Wolfe and Piazza, who is on paid leave while the police department conducts an internal investigation. On the heels of city council members calling earlier this week for further investigation into the traffic stop, Chattanooga-Hamilton County NAACP members held a news conference Wednesday to demand funding for more body cameras and to continue calling for officer accountability and diversification of area law enforcement. "Right now we're looking at the protocol," said NAACP President Elenora Woods, referencing the 10-month gap between the incident and the start of an investigation. A police department spokeswoman previously confirmed no one had filed a complaint before the footage emerged. "Who gets the video?" Woods asked Wednesday. "Who's responsible for viewing the footage? And if there's an encounter that happened like the one we've just recently seen, who's responsible for looking at those and forming an internal investigation? Right now those answers are a little vague. But we believe and we feel that once these encounters occur that someone from the supervisory level — the police chief or sheriff — should be informed immediately so that can be handled accordingly." Woods added she'd met with Sheriff Jim Hammond Wednesday morning about recruiting more African-American men and women from either historically black area colleges or Chattanooga neighborhoods. About 12 percent of Hammond's office is African-American, Woods said, and most of those employees are working in the Hamilton County Jail as opposed to active patrol. The goal is to beef up those numbers, Woods said, and to convince the county to spend about $240,000 that would allow Hammond to lease roughly 200 body cameras for certified deputies, detectives and some jailers. District Attorney General Neal Pinkston has dismissed criminal charges against Frederico Wolfe. "We have been working on this for probably close to eight months," Hammond said Wednesday. "One time we tested a few cameras to see how they worked. The problem was the reliability of downloading them and restoring them for imagery, which was more expensive. Here recently we got a good deal with a new company, so we decided to revisit that in my budget, which has to be presented the last day of this month to [county finance officials]." Body camera footage has been pivotal in publicizing three recent cases of alleged excessive force: In October, East Ridge officers used a choke hold on Chris Penn and stunned him in the testicles with a Taser; in December, a sheriff's detective punched and kicked a handcuffed Charles Toney Jr.; and the Times Free Press published its most complete account of Piazza and Wolfe's encounter on Friday. As other NAACP figures pointed out, body camera footage alone does not end these incidents or ensure the right outcome. "If there's a case where we have body cameras and people are still not held accountable," said Kevin Myles, an attorney and Southeast regional field director for the NAACP, "then we need everybody here in Hamilton County to make sure you are registered to vote. So if elected officials do not hold these individuals accountable, then we can hold those elected officials accountable." The police department has not commented on the specifics of the incident since Friday, though Chief David Roddy said he shared the community's concerns about the video and will appear before the City Council next week to discuss it. Since then, the city turned over Piazza's personnel file on Tuesday in response to a public records request the Times Free Press made Friday. Those files showed complaints that Piazza had lied to his supervisor about turning in evidence on time and played a prank on his colleagues during an active disturbance call that made some of them think they were being shot at. Then, in March 2018, Piazza pulled Wolfe over for speeding around 3:30 a.m. on Lee Highway and noticed the 37-year-old toss a bag of drugs out of his passenger window. When Piazza approached the car with his gun drawn, Wolfe got out as commanded, with his hands up, and placed them on the top of his car. He appeared to follow all of Piazza's orders in the video. As Piazza handcuffed him, though, Wolfe fell to the ground, and Piazza punched him at least 10 times as at least two other officers on the scene helped to restrain Wolfe. It's unclear when Wolfe received the body camera and dashcam footage, or who from the police department has seen it. Piazza charged Wolfe with driving under the influence, possession of a controlled substance, possessing drugs for resale, tampering with evidence and resisting arrest, and Wolfe had to appear at least three times in General Sessions Court. Typically, a prosecutor receives the evidence from the police department and then turns it over to a defendant or their defense attorney.